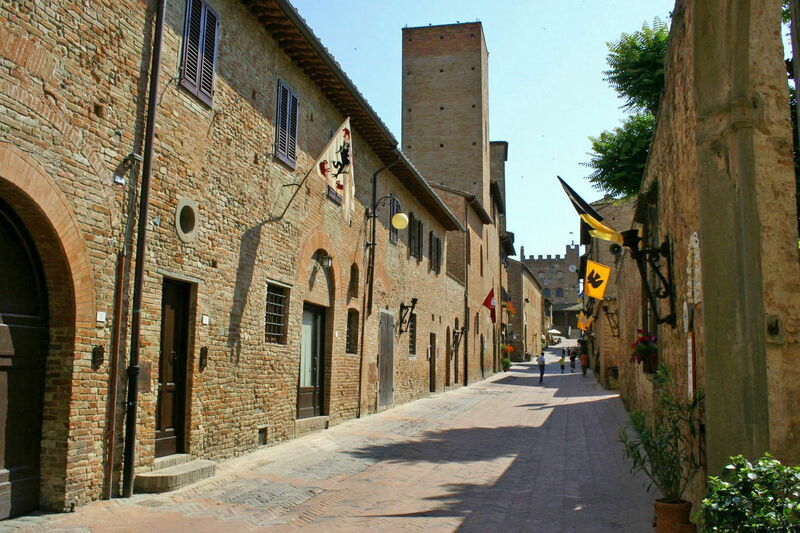 Charming complex situated in the historical centre of the medieval town of Certaldo Alto. The property has been recently and carefully restored and turned into 3 comfortable apartments, all of which tastefully furnished in typical Tuscan rustic style. At their arrival, guests staying at Casa Cornelio will get a permission allowing them to drive to their apartment and make use of a parking situated in an internal courtyard near the apartments. During the month of July (for approx. 10 days) there is a very nice “festival” (“named Mercantia”) taking place in the historical centre of Certaldo Alto (the oldest part of the town), where local artists and artisans show their works until late at the night. During this period of the year the access to the internal courtyard for parking is forbidden. Distances: the centre of Certaldo Basso with all kind of shops and train station (with trains to Florence and Siena) 500 m away (the town is also accessible by a funicular leaving each 15 minutes - duration of the trip 1 minute), Florence 40 km, Siena 35 km, the renowned town of San Gimignano 9 km, Volterra 50 km, Pisa 55 km. Extra services: baby bed available upon request. Cookery lessons at € 75 per person. Upon request the owner can accompany hiis guests to a close farm for a guided tour of the wine cellar (€ 30,-) and for a wine tasting (to be paid on the spot). During the month of June guests have the chance to take part to one of the medieval dinners set along the streets of the oldtown During the first 2 week-ends of October the feast “Boccaccesca' in the historical centre of Certaldo offers to guests the chance to taste the real flavours of the Tuscan tradition. 90 m2. 1st floor: entrance/living-room (TV), dining area and kitchen corner (freezer, oven, toaster, American coffee maker, Italian coffee maker), double bedroom, bathroom with shower, double bedroom, bathroom with shower. Double sofa bed in the living room available upon request at € 50,- / per week (to be paid on the spot). Additional costs paid on site: Security deposit: € 150,-Final cleaning: € 50,-Heating: € 10,- / per dayDouble sofa bed: € 50,- / per week.